A simplified diagram of the Alom Shaha motor. The red arrows indicates that an electric current is flowing in the copper wire. The green lines show the conventional indication of a magnetic field. When an electric current flows through a magnetic field a force acts on the particles carrying current. The direction of the force is perpendicular to both the current and the magnetic field. This drives the wire around the battery as seen in the video. A little while ago I saw a great demonstration by Alom Shaha of an ingeniously simple motor. It was so simple that I immediately thought even I could make it. Now Alom went to great pains to first talk about the demonstration and get people to think what was going to happen and make a testable prediction. I will not subject you to that. Instead I invite you to watch and wonder, secure in the knowledge that at the end I will offer an explanation of sorts. 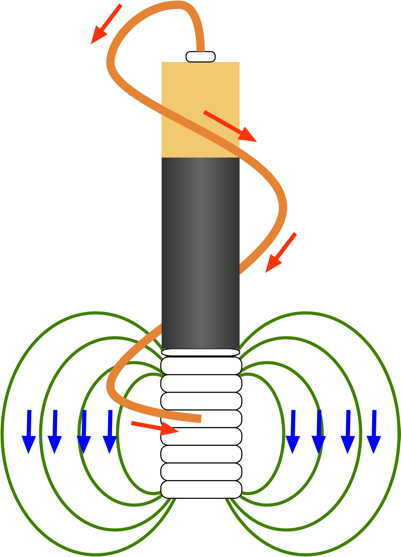 Electric current flows through the copper wire when it touches both the upper terminal of the battery, and the magnets attached to the base of the battery. The magnets are metallic and so electric current can flow through the magnets to the lower terminal of the battery. Near the magnets, the electric current flows through a region of strong magnetic field. In this region there is a force on the wire. This is equivalent to the gravitational force exerted on an object weighing a few tens of grams – such as a few twopenny pieces. As the slow motion footage shows, the electrical contact of the wire with the magnets is only intermittent. During this contact, the wire will receive a ‘kick’. The direction of the force is at right angles to both the direction of the magnetic field and the electric current. In this poor implementation of the original Shaha™ design, the force is unlikely to be directed at exactly the correct direction to cause just rotation. Some part of the force will cause the wire to move away or towards the magnets which is what causes the unstable rotation – and the occasional loss of contact with the magnets. To reduce the friction of the rotating part. To put more wire into the magnetic field so that a given current produces the largest force. To have the strongest magnetic field created by the lightest components. And even if you couldn’t follow the explanation, I hope you enjoyed the movie. If you want to reproduce this then you may like to know that I used these magnets from First4magnets.com. This entry was posted on May 24, 2012 at 6:00 am and is filed under Personal, Protons for Breakfast, Simple Science. You can follow any responses to this entry through the RSS 2.0 feed. You can leave a response, or trackback from your own site. Lovely diagram, video and explanation. Really pleased you like the motor but I’m not sure it’s fair to whoever first came up with this to call it the Alom Shaha motor (as much as I would like to have something named after me). I’m sorry, but I can’t recall where I first saw it. A lot simpler than the NPL electric motor demo!